Given the seriousness of the situation, the U.S. Agency for International Development (USAID) Office of U.S. Foreign Disaster Assistance (OFDA) deployed a Disaster Assistance Response Team (DART), as an interagency platform for coordinating operations to end the outbreak. In the event of a war, earthquake, hurricane, or other disaster outside the United States, OFDA can quickly mobilize such a team to assess humanitarian needs, assemble expertise from many parts of the U.S. government, contract with trusted global partners to provide essential services, and help manage the response, drawing on a pool of flexible funding to finance the activities. The DART worked in concert with a corresponding response management team in Washington, D.C., which helped assess strategy, and lead an U.S. interagency response to quell the outbreak. 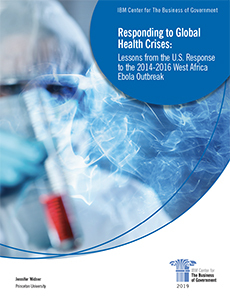 Professor Widner, who directs the Innovations for Successful Societies, a Woodrow Wilson School research program on improving government performance, has extensively researched and reviewed the U.S. DART deployment to stop the spread of Ebola in West Africa. Her report describes how collaboration among multiple agencies, across national governments, and with a full spectrum of global partners was integral to the U.S. response. The report draws on original research and extensive interviews of DART leadership and key stakeholders involved in the response. The report assesses the DART in four phases. Under each phase, the author details insights and key lessons learned that frame practical advice on for effective collaboration across agencies and national governments. From this rich narrative, the author also conveys the actions taken by the DART to ameliorate and transcend core challenges in mobilizing a response to a global health crisis. According to Professor Widner, DART staff often described their work as “building the plane while flying,” which was an apt description for the Ebola crisis. Before responding to a disaster, end goals, roles, and protocols must be clear, but leadership could plan only up to a point. We hope that this report, which tells a story about effective crisis response collaboration—and from that story offers insights, reflections, and lessons learned—can help government leaders and stakeholders who may encounter similar situations to prepare and respond effectively and efficiently.